When the Fort Magic kit arrived, the girls and I could not wait to dig into the box and see what we could build. With 350+ pieces the possibilities are endless. The kit comes with 382 pieces. These pieces include straight pieces and curved pieces in several different sizes as well as a variety of connectors and fabric clips. There is also a storage bag and a book full of fort ideas that you can build. In addition to the included book, you can also check out the Fort Magic website for even more great ideas! We decided to start with something fairly simple so out first creation was a house with a door that could actually open and close. After a couple days with the house the girls wanted to try building a couple spaceships and they even built an alien friend. Once they were done with the spaceships we built a giant tunnel that took up half of the room!! The connectors are easy enough for my four year old to assemble. 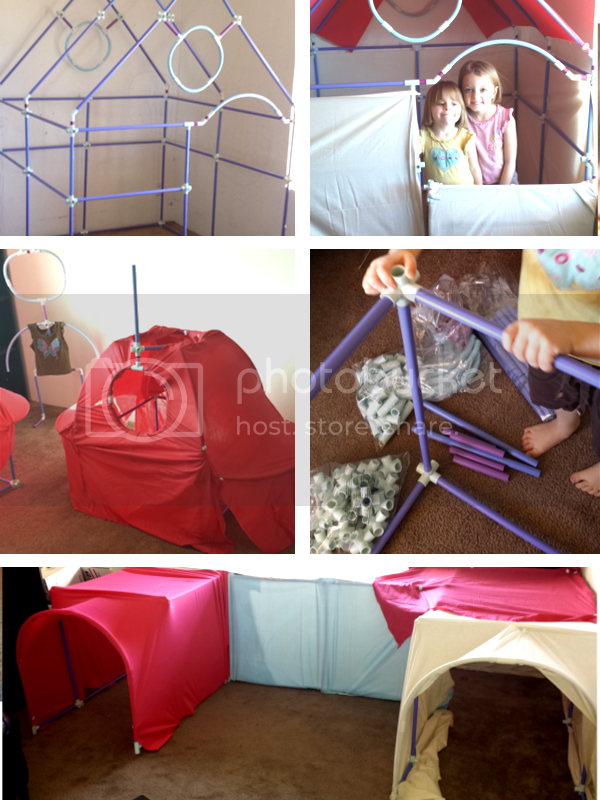 And the pictures in the book make it pretty easy to make a variety of forts. Once the forts were complete we used the fabric clips to attach a couple of sheets and fabric from my fabric stash. The girls are having such a blast with this kit and I'm not going to lye, I've had just as much fun helping them build their creations. I can definitely see this kit getting a lot of use. I've also been told that Fort Magic has fabric covers coming soon!! Until then, you can visit fortmagic.com/ to learn how to create custom covers and accessories just like their dressed fort images. 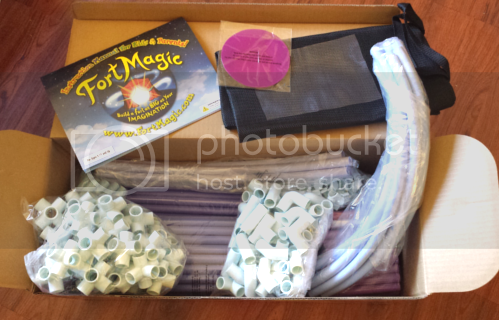 Thanks to the great folks at Fort Magic, I am giving a Fort Magic kit away! It has a retail value of $199 and includes the shipping cost to US and Canada addresses. Contest will run until Tuesday March 11th. Oh, how fun. My granddaughter would just love this! Thanks for a chance to maybe win it. The castle for sure! Thanks for the chance to win! I think I'd have to go with the pirate ship! Perfect for my little guy! Trying to find fun things to do indoors since it's so stinking rainy here! The castle would be awesome for my grandchildren! Would love a castle fort for my daughter! So fun! I would make the tunnel and fort or the riverboat first. These are so fun! I love that you can make a fort! Our daughter would have a blast with the castle and tunnels! What a cool fort set! Wed probably start with the playhouse! My daughter would love the castle. I would make that first. My grandkids would go crazy for that kit! The house looking fort! My 2 year old would LOVE it! Definitely the castle! My son loves them! I wanted this for my kids for Christmas but didn't end up getting it. We would love one! I would want to make the tunnel! I love this idea! 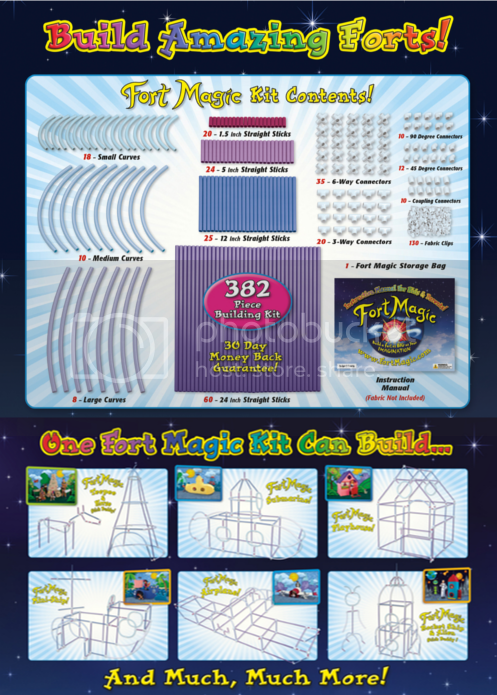 Oh I know Carter would want to build the Fort Magic Airplane first! This product looks so fun! My little one Charlotte would just love it! This would be a great surprise for her after I get back from being gone for a few months with the navy. This looks like a blast! I think it would be fun for us adults to play in with the kids! Pirate ship....or a castle. Man, why didn't they have this when I was younger?? Cool! 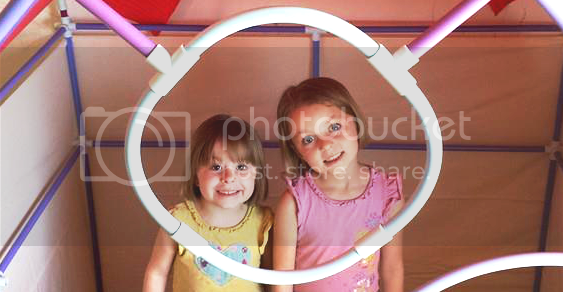 My brother and I would have loved this when we were little. I'm sure my husband and my girls would absolutely adore a kit like this. We have something similar and they play with it all the time, but it only has 40 or so pieces and just doesn't build anything big enough for a 9 yr old and and 6 yr old to play in. They've tried, but finally resigned themselves to just making forts for their dolls. We would love either the fort or the castle. I would build the teepee! I would build the castle. A must have for anyone with kids! I would love to win this for my nieces... and my brother too!! Love the castle, and the mini space ships! I think my class would want to build the rocket or the car first. I am sure my girls would want to build the castle. So fun!! My little guy would definitely build the rocket ship first! My son would love the house with a working door. I've had my eye on Fort Magic for a few weeks now...it sure would beat making forts out of couch pillows! This is cool. We have something similar that is industrial strength called Quadro (http://www.creativekidstuff.com/p/51317/quadro-advanced-construction-kit). I want to make the pirate ship! My kids would LOVE this....we'd start with a car! The submarine. My kids would LOVE this. My girls would love the fort! She thinks she's a princess so I'm sure she'd LOVE the castle. My daughter informed me we would build the teepee and horse, cause she thinks those would be most fun. Love how durable this product seems to be! We would build a tunnel! My little one LOVES tunnels. My kids would build the pirate ship! My kids would love the pirate ship and the castle! My so would love the rocket ship so much...and a castle for his unicorns. How do you choose!? on Fort Magic's Pinterest page, they have a a pin of some children who built the "Playhouse" around their bed--I thought that was cool! my son would love to build the teepee first!! Wish we had this kit already, as we are needing a PIRATE SHIP for our school library. This is fantastic. I think the submarine would be first for us. My son has his room decorated in an underwater theme! So many possibilities...my boys would be so excited to build the teepee first! We would build the fort/tunnel combo first. I would def build the Castle for my daughter first!!!! I think it would be "fight" between one of the cars and the castle for my four! thanks for the chance to win! I think the playhouse is so adorable. I'm sure my 3 girls would want to build the castle first!